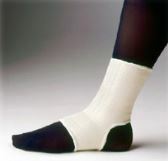 Durable lightweight knitted elastic provides support with flexibility. Indicated for support of weak ankles or minor sprains. Light enough to be worn with shoes. Unique seamless construction will not irritate skin. Open heel, easy slip on style. Provides excellent compression and stabilization for weak or injured ankles. Made of a stretch knitted Lycra/nylon material that makes a lightweight and breathable alternative to neoprene. Lycra provides compressive support while maintaining flexibility. 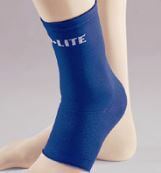 For consistent compression and therapeutic, soothing warmth to the swollen, tender or injured joint. Tri-Permalon™ top is comfortable against the skin and allows air to circulate for extended wear. 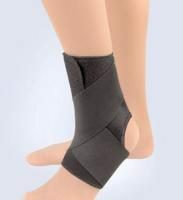 The double elastic strap offers adjustable compression to both the medial and lateral sides of the ankle and arch of the foot. The wide strap simulates taping and wraps in a figure-eight design with a simple hook closure. 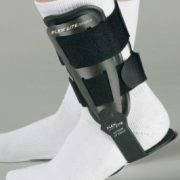 Indicated for swollen, tender or weak ankles, sprains, strains, sports injuries, and arthritis.